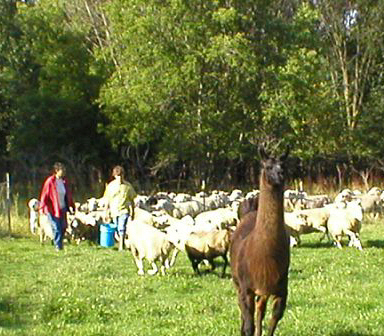 Guardian llama and dogs are natural protectors of sheep and goat flocks. Although, shepherds have always been the primary guardians of the flocks, other animals are willing and able to protect sheep and goats from danger. Ancient tapestries and frescos depict flocks of sheep with their shepherd and guardian dogs. Llamas and donkeys also make worthy protectors. As new urban developments expand, more predators are pushed to increase their hunting territory into back yards and pastures. 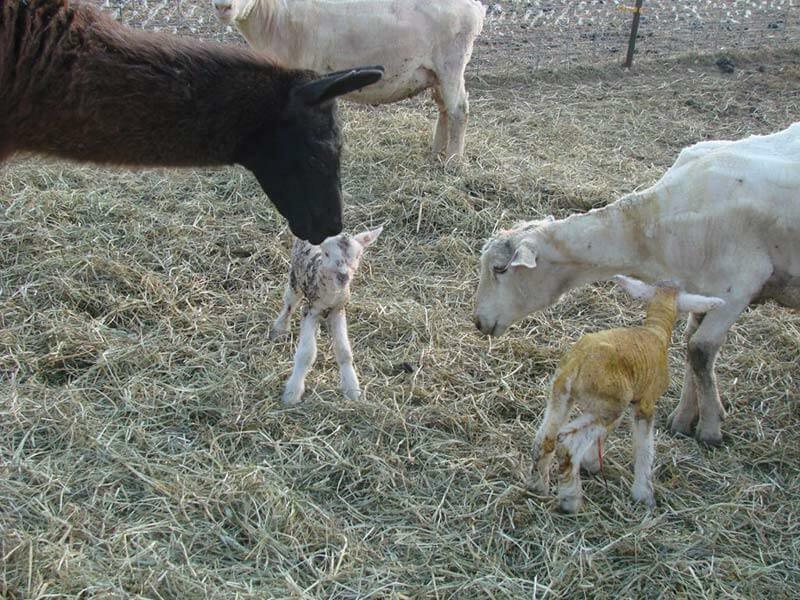 Lambs and baby goats are a delicious, easy-to-catch treat for coyotes, cougars and wolves. Sheep and goats have limited means of defense from predators. While a ewe will stomp her feet, run at and even body block a large dog that gets too close to her babies, and a mother goat will use her horns to protect her baby, neither lambs nor goat kids are a challenge to a predator that has many hungry mouths to feed. As the picture illustrates young lambs are very vulnerable. To stay safe, sheep and goats keep watch over their surroundings and flee from perceived danger. When sheep bed down they usually do so on a high area so they can keep watch. Sheep can spot predators that are over three-quarters of a mile away. Dogs have been bred over the ages to live with and protect sheep and goats. These special dogs are usually Great Pyrenees, Maremmas or similar breeds. They are large white dogs with floppy ears that do not trigger an instinctive fear reaction in their bonded group. The puppies are born and raised with the flock and it has been reported that occasionally a ewe will adopt and nurse a pup. Guardian dogs accept the sheep and goats as their pack and protect them as they would their own families. Predators, such as wolves, will usually not intrude into another dog’s territory. When a wolf is pressured into the guardian dog’s area by lack of food, it is usually confused by a dog surrounded by a huge “pack” of sheep or goats. A wolf may still catch a stray young animal and risk a fight with the dog, but usually it will decide to move on to easier prey. Guardian dogs rarely actually fight off predators. Generally, their size, bark and assertive posture are enough to discourage most predators. In rural areas where wolves have been recently released and protected their natural shyness and hesitation to risk injury in a fight has lessened. A pack of wolves can decimate a flock of sheep or goats. In such cases shepherds have increased the number of guardian dogs that protect their flocks as a lone dog is easily killed. 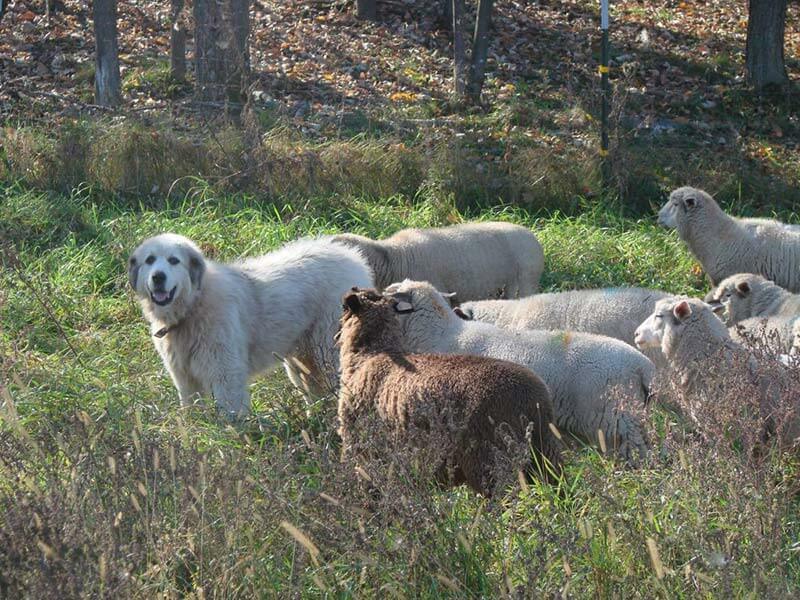 We have five guardian dogs that blend in with the flock to keep their adopted families safe. Llamas and guardian dogs often work as a team. Llamas have marvelous eyesight and are usually the first to see anything new in their pasture. If it is a strange dog or coyote they run towards it with their heads stretched out low to the ground. They use the side of their heads to strike. The force of their strong necks can send a dog or coyote rolling. They also scream, stamp, and kick with their feet. They are capable of stomping a coyote to death if the coyote refuses to retreat. Under attack sheep and lambs will gather into a tight circle. Llamas, with guardian dogs, will stay on the outside of the circle and chase off the intruder. Coyotes and dogs are not quite sure what to make of such a large, odd animal attacking them. Predators cannot risk becoming injured in a fight if there are easier ways to find food. They are usually cautious about being spotted or attacked and retreat rather than confront. A lone llama is not a good match for a dog or wolf determined to attack. Although brave they are vulnerable. Guardian dogs and llamas together make a good team. Both sheep and goats like to follow the biggest flock member. A llama new to sheep appears confused by all its followers, but soon takes on the role of leader, with all the responsibility of that role. When llamas live with sheep, the sheep follow the llamas out to graze, to water and to the llama’s favorite observation and loafing areas. Llamas are very curious about human visitors. They wiggle their ears and come up to sniff. Sometimes they will rub their noses against your shirt or face. They have good memories of people they do not like (such as veterinarians) and will keep their distance. Llamas communicate by humming. Baby llamas (crias) identify their mother by the unique hum she sings at birth. In contrast to popular opinion, llamas seldom spit at people, even when upset, unless trapped. This happens sometimes in petting zoos when the llama cannot get away from too much attention. It is normal for llamas to spit at each other, especially if a younger llama disrespects an elder. In the Peruvian Andes, their native home, llamas were honored as a noble animal by the Inka kings. Llama feet are eco-friendly, composed of two leathery pads with toenails to grab the terrain. This makes the llama very sure-footed and a good pack animal with little impact on the environment. Carrying nearly 100 pounds they are used over some of the roughest and highest mountain terrains. Their wool is woven into the warmest, lightest garments available today and comes in a variety of natural colors to the delight of spinners and weavers.